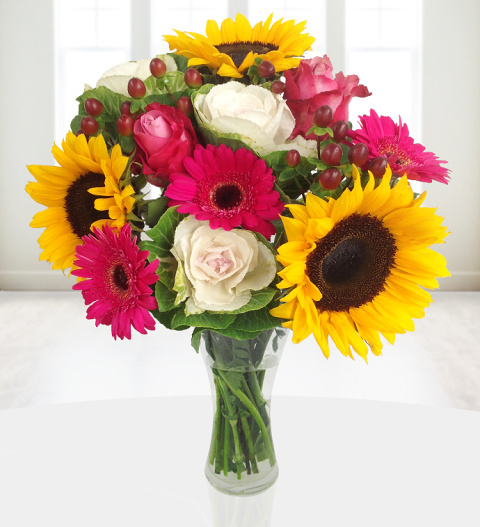 Our Sunset bouquet is a dashing bouquet with British grown sunflowers, sweet smelling deepwater roses, germini flowers with white brassica. This bouquet gives that instant &apos;wow&apos; factor and is quite simply perfect for all occasions. Each bouquet is skilfully arranged by our incredibly talented florists. Sunset is available for UK next day delivery and comes with a FREE box of delicious Belgian chocolates! Chocolates may contain nuts.